About two weeks ago, residents on Pescador Drive and Angel Coral Street in San Pedro made a formally complained to the Chairman of the Ambergris Caye Local Building Authority, Councilor Joseph Elijio. The complains originated from a construction that is in progress. The business is under the name Paz Sister Company Limited; a business owned by four sisters, the Mayor of San Pedro, Her Worship Elsa Paz, being one. Neighbors claimed that the construction falls within their properties and that the balconies constructed on the second floor of the building invaded the upper space of their properties. They also informed the Local Building Authority that the construction itself had deviated from the originally approved planned. It took over two weeks before the Ambergris Caye Local Building Authority met, and the news is that a stop order was prepared by the board. The meeting took place on Monday night and according to Councilor Elijio, it was found out that the contractors had indeed deviated from the approved plan. Councilor Elijio said "the mayor was not complying with the plans approved by the Local Building Authority," and as such "a stop order was prepared during the meeting." 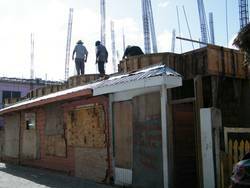 Elijio said that he was waiting for two weeks for a surveyor's report from the Mayor's family owned construction, but it was never handed to the Local Building Authority on the given date. The Sun contacted Deputy Mayor Pablo Ico who would only say that the meeting ended in "ruckus" and he would not comment on the record since the matter is "delicate." The Sun also spoke to the Vice Chairman of the Local Building Authority Frank Panton who refused to comment stating the issue is also delicate.Councilor Elijio would not confirm if the stop order was executed since he was out of office for the day. Operation on the building has stop and as such, it is left to see the next course of action that the Local Building Authority will take to remedy the situation. The San Pedro Sun tried contacting Mayor Paz for comments but the secretary at the San Pedro Town Council told us that she was out of the country.